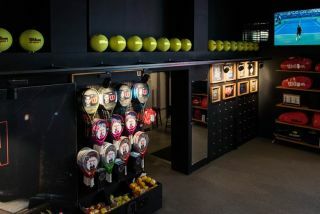 All of It Now, a creative design agency in San Francisco, used Epson laser technology, including its LightScene EV-105 accent lighting projector, in Wilson Sporting Goods' high-traffic store venue to empower a creative shopping experience. The new store is open now through September 9, 2018 on the grounds of Flushing Meadows Corona Park in New York City. To bring the new Wilson Sporting Goods store to life for tennis fans, All of It Now chose Epson’s reliable laser projector solutions that offer precise image quality and flexibility while seamlessly integrating into the infrastructure. Epson’s new LightScene EV-105 laser projector combines illumination and projection into a sleek and flexible design, allowing for easy content mapping on to jumbo size tennis balls. Adding an additional layer of experience to captivate and engage shoppers, LightScene EV-105 offers flexibility, easy installation and mounting in unique retail spaces. In addition, the team utilized an Epson Pro L25000U laser projector, delivering up to 25,000 lumens of white brightness and 25,000 lumens of color brightness to project a video inside the store.